A classic piece of fanfiction that appeared as a standalone fanzine in 1954 and was first published as an Ansible Editions ebook for the TAFF site in May 2015. The cover is by Ross Chamberlain, from the third edition of 1971. 18,000 words. The Enchanted Duplicator has been many times reprinted, and online text versions have circulated since the early days of the Internet. It is often called the Pilgrim’s Progress of fandom – although, oddly enough, neither Walt Willis nor Bob Shaw had read Bunyan at the time of writing. The story tells of the archetypal fan Jophan’s allegorical quest for the Enchanted Duplicator or Magic Mimeograph that according to legend is needed to produce the perfect fanzine. 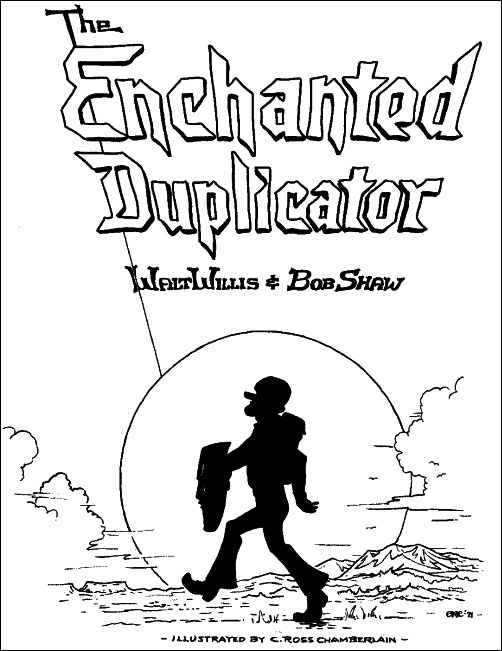 Although the essence of The Enchanted Duplicator is crystal clear, some allusions to the contemporary fanzine and fan-publishing scene can now be a little puzzling. This ebook – based on the eighth print edition published in 1983 and digitized in 1985 – includes the useful explanatory endnotes from the 1979 reprint as a fanroom publication of Seacon ’79, the first Brighton Worldcon. These were added by Eve Harvey and later expanded by David Langford. Rob Hansen’s The Reaffirmation (1995) is a sequel which revisits the same territory and is also available from the TAFF ebooks page.